Chinese investors have been a major player in the American real estate world for a while now, but did you know they recently surpassed Canada as the largest foreign investors? Their investment has grown dramatically since 2013, according to a report titled Breaking Ground: Chinese Investment in U.S. Real Estate. 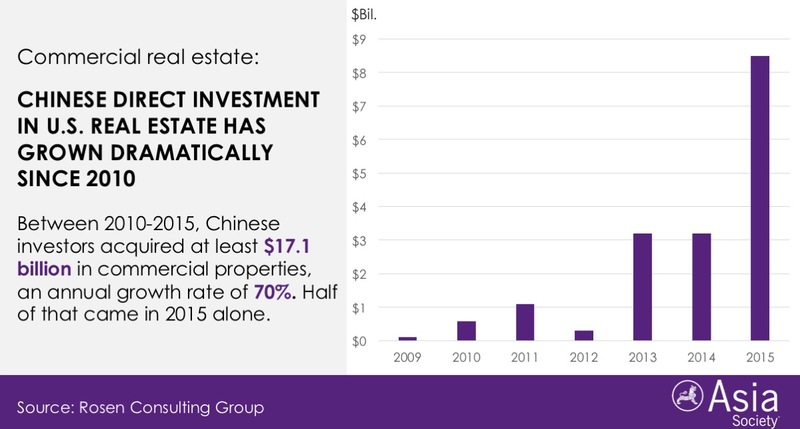 Figures included in the report say Chinese investors acquired at least $17.1 billion of existing commercial property between 2010 and 2015, representing an annual growth rate of 70%. Half of that investment came in 2015 alone. For example, Chinese investors bought NYC’s famous Waldorf Astoria hotel, and also struck a $6.5 billion deal for Strategic Hotels & Resorts earlier this year. The size of their total investments has generally been good for the United States real estate economy, helping the market to recover from the crash that began in 2006. The Chinese are also choosing to invest heavily in residential real estate, with $93 billion being spent on homes between 2010 and 2015. In the last 12 months recorded (March 2014 to 2015), home purchases totaled $28.5 billion. Many of these investors bring their children over to the United States to get their education while they manage their properties and work. Many wealthy Chinese choose to do this is because of a program called EB-5, an immigrant investor program. Basically, they can invest their capital into US projects, making it faster for them to obtain their green cards. Since Congress created the program in 1990, it has resulted in $11 billion of investment from the Chinese (which is 70% of the total EB-5 investors from all countries). The report also states that investors are keeping their eye on growing markets, and will continue to invest in profitable cities. While they traditionally invest in larger cities like New York, San Francisco, and Los Angeles, more and more Chinese are looking for other valuable markets. The report mentions Tennessee, Missouri, Georgia, and North Carolina, but they are also setting their sights on our profitable Texas markets. Asian investors accounted for almost a third of Texas home sales to foreign buyers, sitting behind Latin Americans who accounted for around 40%. There is also a noticeable growing Chinese influence in the Dallas/Fort Worth housing market. For example, developers who are redoing downtown Dallas’s landmark Statler Hotel have been courting Chinese investors. Chinese money has also funded recent downtown Dallas tower sales, and capital from China is also funding local apartment projects. It all boils down to the fact that United States (and Texas, specifically) real estate is a solid investment right now. The Texas market is still affordable, especially compared to the major cities foreign investors traditionally concentrate on. Not to mention, it doesn’t seem like our growth is going to stop anytime soon. The United States in general remains stable economically and politically, and the dollar, to international investors, remains a strong currency.